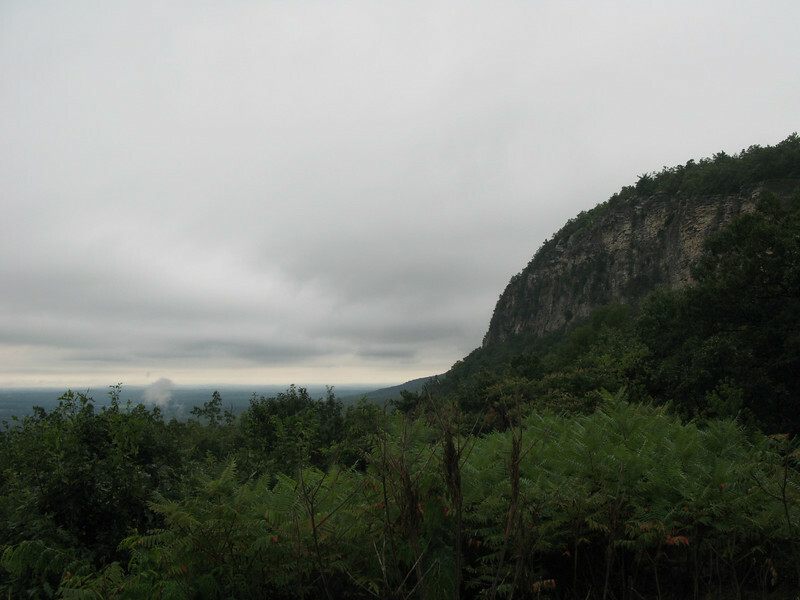 Our first view of the Gunks, albeit a rainy one, and a sign of things to come. A real climbing trip! Camping with a carabiner under my pillow, eating Larabars with my harness on standing at the base of a cliff, ripping skin off my fingers, funky tan lines, sweet photos... all of these things come to mind when I think about what a real climbing trip should be like. I've been reading trip reports by fellow climbers and jonesing for the chance to write a real trip report of my own. I had the immense good fortune of spending a long weekend in the Gunks, thanks to Nina's planning and other friends met via social media. As it turns out, my little twitter climbing community's personality mirrors what I've discovered in real-life: climbers love to look out for each other. Nina and I initially started discussing a Gunks trip a few months ago. Our goal was to learn to set anchors well enough be self-sufficient outside and to spend a full day trad climbing. Most of my non-bouldering experience is indoors, and I'd never touched a nut, a cam, or an alien. Perhaps we should've tempered our expectations... Regardless, we decided to take on all the learning we'd need to do under Jason from High Xposure. He'd been recommended as the perfect guide for us, which he did turn out to be. As soon as I posted something about heading to the Gunks on twitter, @cliffmama, one of the amazing ladies I've been following, quickly responded. She invited us to a yearly Gunks family party she hosts and offered to let us spend the weekend camped in their backyard. I couldn't believe the extraordinary kindness, and experiences like this renew my faith in people. I'm still counting my blessings. After waking up to a downpour in Philly and hearing the weather was the same at the cliffs, we took our time and got to the Gunks house mid-afternoon. New Paltz is a wonderful little town full of quirky shops, coffee houses, and college students and I felt right at home. 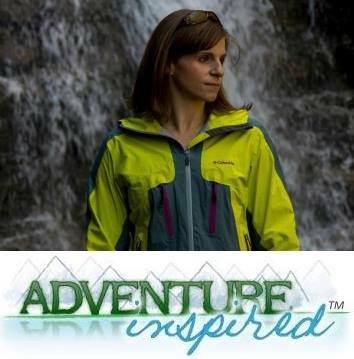 Jannette's managed to be a working mother of two, a climber, and do both extraordinarily well. She's inspiring, as are her girls! Nina hanging on her first trad anchor! We woke late Saturday morning to more rain, which meant wet rocks and no climbing. We were determined to make the best of the day and decided on a half-day anchor setting and gear placement lesson with Jason. We'd learn on the ground under an overhang on mostly wet rock. For me, one of the most intimidating things about getting into outdoor climbing is learning the skills you need to keep yourself and your partners safe. And more than just learning them, executing them without making mistakes or getting complacent under pressure. Jason kept telling us there's absolutely no reason for a ground fall, but it happens mostly due to human error - errors we can prevent. We learned how to set top rope anchors with slings, how to clip in to an anchor and belay someone from above, rope management, and all sorts of different knots. The last couple hours were spent practicing our anchor setting skills on gear. Jason brought a full rack and let each of us set up anchors on different parts of the rock. He taught us how to place cams, nuts, and stoppers, how each piece works, how to test each piece, and how to apply our anchor setting skills when there are no chains to clip into. We weighted the anchors to test their strength, and despite only being four feet off the ground, I was giddy when Jason told me all my placements were bomber and my anchor held. Goofing around on Gunks boulders. It was misty and hazy outside the tent Sunday morning, and with the assumption the rock would be wet all day, we decided to cancel our day with Jason. We came to regret the decision a bit after lunchtime when the sun came out, the clouds cleared, and it turned into a beautiful afternoon. Rather than admit defeat, we took my Organic Climbing crash pad for a walk along the West Trapps cliffs to find bouldering. None of us invested in a guide book for the short trip, as we expected we'd be top-roping or trad climbing with our guide. But with the weather problems, we ended up seeking his advice on bouldering spots instead and wandering along the trail looking for our own problems. A friendly group from South Jersey gave us a list of great problems to try and we set to work. I managed to accomplish a couple of the "real climbing trip" items mentioned above, including getting my foot stuck in cracks, ripping skin off my fingers, and eating a Larabar standing next to the cliffs. 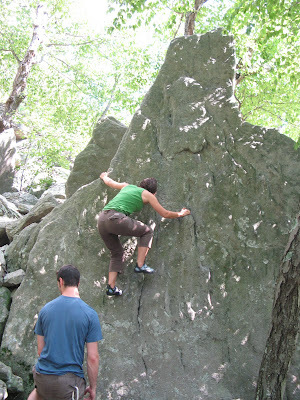 Transitioning from gym climbing to outdoor climbing can be challenging, a fact I'm sure other climbers can attest to. 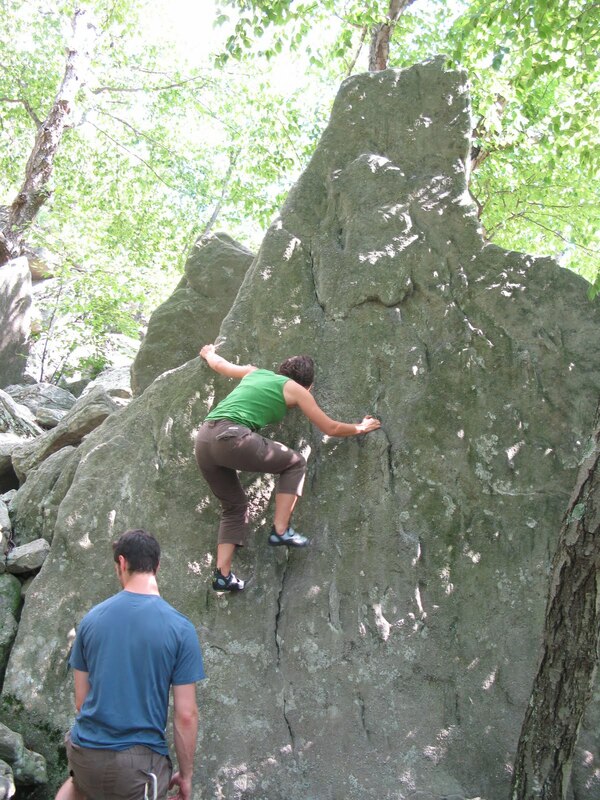 I've bouldered outside, but only outside of Philly; my outdoor experience is limited. I found myself clinging on to the middle of a V2, completely lost and 8-10 feet off the rock-covered ground. I ended up down climbing, hanging on much longer than I thought I could, and jumped down when I felt it was safe. Having a good crash pad and a good spotter is absolutely vital. The highest point I topped out at was just over 15 feet, and had I been in the gym, I might've given up and jumped down when it got difficult. But bouldering outdoors, jumping down can be unsafe. As scary and as challenging as the problems were, I really, really enjoyed myself. 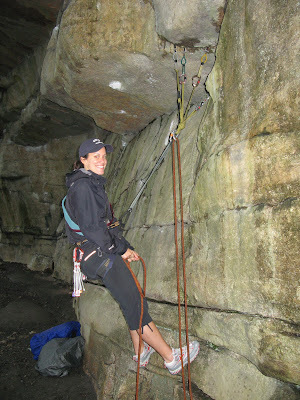 I'm itching to get back up to the Gunks, or anywhere outdoors, and test out what I've learned. Being afraid of falling in the gym is one thing, but I found that fear exponentially more noticeable outside. Throughout the course of the day of bouldering, though, I began to really physically understand a concept I've just intellectually explored: the more afraid and out of control I was, the more likely a fall was. I started trying to control my thoughts, and am eager to achieve some level of mastery at it. And despite the awful weather, it was a fantastic weekend. I met dozens of amazing climbers ranging in age from 5 to 40-something. I'm eager to get back up to New Paltz, and in the meantime, I've got to invest in a rope and a guidebook! Who's been to the Gunks and actually climbed up high? Any advice for beginners when it comes to trad leading? We'd love to hear from you! We enjoyed your company very much (that goes for Dan and Nina too), and please make sure to let us know the next time you plan to come to the Gunks. Appreciate your help cleaning up - and as the magnet on my fridge says "Make yourself at home, clean my kitchen!". Hope your next trip will have better weather (this weekend is looking stellar!). Looks like a good time, too bad about the weather though. It's always a good thing to practice different climbing skills. A good thing to learn would be rescue skills like how to rappel with a biner, how to rappel with an unconscious person, how to escape belay so you can anchor your climber to something and run off to get help.